A combined protein/polymer-engineering approach prolongs protein circulation and enhance drug accumulation in tumours. Consider insulin and you will have no doubts that a protein could be a drug. As proteins are coded by a corresponding DNA, the application of recombinant DNA has been largely exploited in clinics to provide patients with therapeutic 'recombinant' proteins. Among the advantages of owing a potential pharmacon on a plasmid, and growing such a marketable molecule in cell cultures, is the possibility to engineer the drug protein to ameliorate its efficacy. Therefore, one could change few amino-acids to improve some binding activities, combine two protein moieties to obtain a new double-edged drug and so on, depending on the creativity of the medicinal chemist synthetic biologist. Some proteins like interferon-α2a are effective against cancer, but are toxic also for other cells. Therefore, some engineering could maximize protein delivery to tumours while minimizing its bioavailibility to other organs. Gao and colleagues from Duke University, reasoned about a potential trick to do this job. The microvasculature of tumours is leaky compared with that of most normal tissues, therefore a drug complexed with a 'bulk' polymer would leak slowly from healthy microvessels, but quickly from the microvessels supplying tumours. As a proof of concept, they injected a normal green fluorescent protein in the mouse tail vein and monitored its accumulation in the tumour. Then, compared it with a second GFP in which its C-terminus was used as a docking site to grow a long polymer tail. A post-translational protein splicing strategy was used to install a polymerization initiator at the C terminus, followed by in situ living methacrylate polymerization. 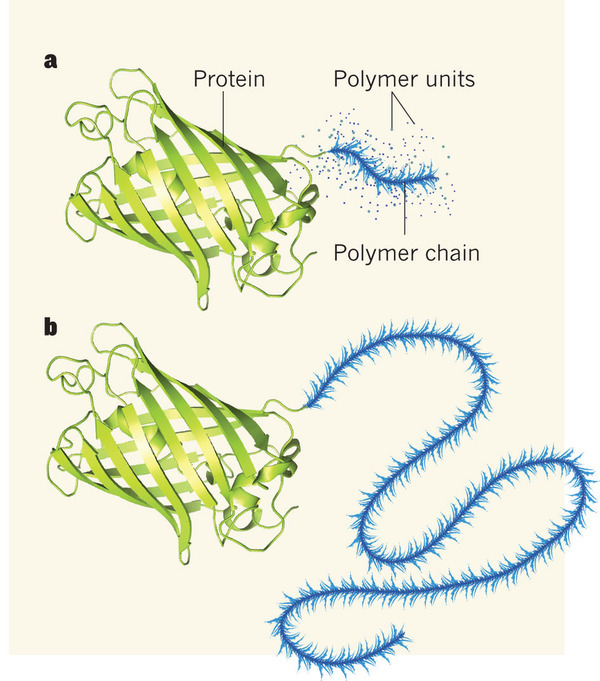 The resulting 20-nm polymer–protein conjugate did indeed experience longer circulation times, and it leaked into tumours in mice 50 times more efficiently than the unmodified protein. In conclusion, the pharmacokinetic profile of therapeutic proteins could be significantly ameliorated by protein engineering. Synthetic biology has been previously blamed to be nothing but a cool divertimento for junior scientists less serious than the senior medicinal chemist. The work of Gao and colleagues indeed demonstrate that plasmid juggling can provide us with better drugs, lets play the game again and again.